Typing machine with gaming aspirations. The Acer TravelMate P255-MG is first of all a notebook for office use. Interestingly, the device is also outfitted with an AMD graphics solution that is usually strong enough even for more demanding games. Our review reveals more. 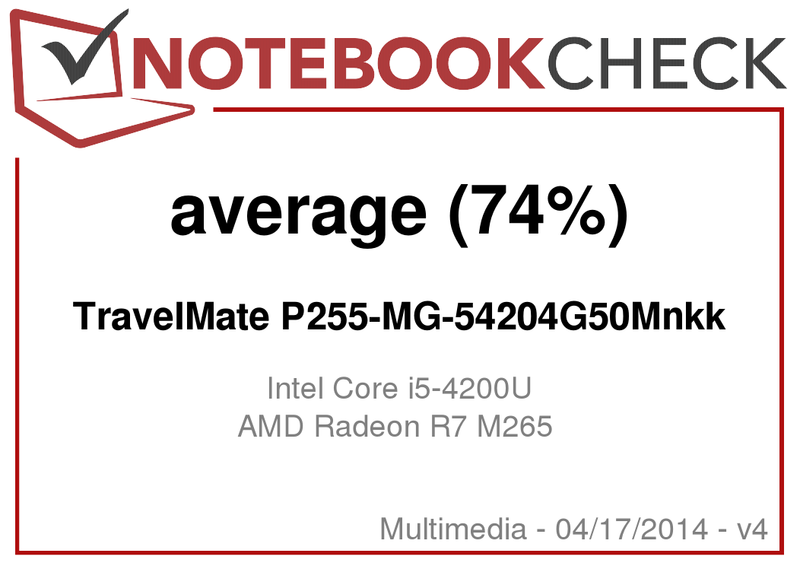 The version of the TravelMate P255-M that lies before us is one of the first notebooks we have reviewed with the new AMD Radeon R7 M265 graphics solution. We already reviewed the predecessor Acer TravelMate P255-M, which had an integrated graphics solution (Core i5-4200U, HD Graphics 4400). Our current review model's construction is almost identical, though besides the AMD Radeon R7 M256, the new version is also equipped with a new display from a different manufacturer. The new display panel from Au Optronics is a minor improvement over the P255-M's previous display. Granted, at 1366x768 pixels, the resolution remains the same, and nothing has changed in regard to its 15.6-inch diagonal or its LED technology, but its brightness and contrast have improved. Whereas the previous average brightness level was 169.4 cd/m², the new panel reaches 189.4 cd/m². The contrast is also better -- at 478:1 the TravelMate P255-MG's contrast value is substantially greater than its relative, the TravelMate P255-M (266:1). The two displays differ from each other in terms of their color and grayscale reproduction as well. In the grayscale, the TravelMate P255-M's average DeltaE 2000 deviation from the target value was 8.1, but the P255-MG's average grayscale deviation proves to lie at a somewhat higher 9.48. When it comes to color, the P255-M's deviation only comes to 7.0, but the P255-MG once again exceeds that deviation at a DeltaE of 9.35. 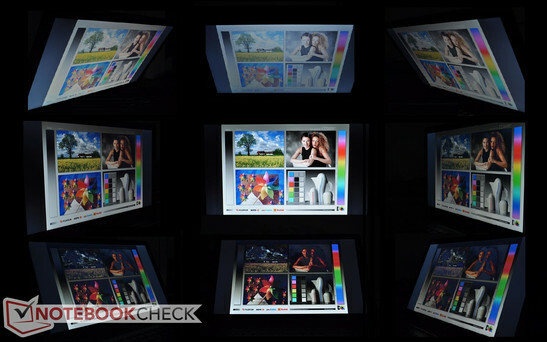 As you can see from the viewing-angle images, the new panel also has problems at various angles. The display very quickly distorts the contrast so much that the user will have trouble reading the screen content. Thanks to the added AMD Radeon R7 M256 graphics chip, the Acer TravelMate P255-MG offers considerably stronger performance compared to the P255-M -- which curiously happens to be more expensive. Even newer games can be played -- at high details -- on the notebook. In this area, the Acer TravelMate P255-MG-54204G50Mnkk is identical to the P55-M we already reviewed. Like its relative, this device is also equipped with an Intel Core i5-4200U processor. The two cores run at a base frequency of 1.6 GHz, but in turbo mode the CPU kicks into gear and raises the clock rate to 2.6 GHz. The ULV Haswell processor consumes 15 W worth of energy (Thermal Design Power). Once again, we used the Cinebench R11.5 benchmark to measure the computer's performance. As expected, there is hardly any difference between our review device and the TravelMate P255-M -- at least in the CPU tests. In the Multi 64-bit test, at 2.47 points (P255-MG) vs. 2.49 points (P255-M), the two notebooks are practically tied. In the Single Core test, too, the two devices scores hardly differ. The TravelMate P255-M scores 1.0 points, whereas with the same chipset, the P255-MG achieves 1.1 points. However, the difference between the two devices is more drastic in the OpenGL test. With the substantially faster Radeon R7 256M, the Acer TravelMate P255-MG gloats over its relative at a full 32.4 frames per second. The P255-M with its Intel HD Graphics 4400 falls far behind here, as it can only offer 12.96 fps. We use PCMark 7 for this measurement as well. One ought not to expect any huge leaps here, however, as the Intel Core i5-4200U processor is the same and graphics performance does not carry much weight in this test. The end result of 2582 points leaves our review device with an about 8% lead over the Acer TravelMate P255-M's 2373 points. Similarly, in terms of performance for office tasks, like surfing the Internet or playing media, there is hardly any difference between the two siblings. Both devices perform reasonably well. Both versions can bottleneck at the hands of the mass-storage device, but not here. The Acer TravelMate P255-MG is outfitted with a 500 GB hard drive from Seagate's Momentus series. The drive runs at 5400 rpm and is completely identical to the HDD at work in the Acer TravelMate P255-M. Unsurprisingly, of course, the results in CrystalDiskMark 3.0 are almost identical. For its build, the storage medium makes a very good impression, even if it does not set a record for performance. A Solid State Drive could provide an additional boost in this discipline. Now we come to the biggest distinction between the previously reviewed Acer TravelMate P255-M and our TravelMate 255-MG. The two notebooks are both equipped with an Intel HD Graphics 4400 graphics solution, but the P255-MG also offers the huge performance boost provided by an additional AMD Radeon R7 256M GPU. When the Radeon R7 is activated, the difference between the two devices' graphics performance is quickly discerned. In 3DMark (2013), the TravelMate P255-M only managed to score 3939 points in the Cloud Gate Standard benchmark. The model with the AMD graphics chip sprints far ahead here. The Acer TravelMate P255-MG curtsies after achieving 5435 points in this test. That is an improvement of almost 40%. In addition to the synthetic benchmarks, we also ran tests intended to simulate practical, everyday use, based on games. Like with the TravelMate P255-M, we used the current games Tomb Raider, FIFA 14 and Battlefield 4 for this purpose. We also utilized the game BioShock Infinite as a further gaming performance check. The results are thoroughly respectable. While the Acer TravelMate P255-M was hardly useable for more demanding games, thanks to its AMD Radeon R7 M256, the TravelMate P255-MG can even run the heavyweight Battlefield 4 at medium details. While the Intel HD Graphics 4400 already struggled to reach 22 fps in the ego-shooter at low settings, the AMD graphics solution doubles that number to 44.7 frames per second. The other games prove to follow a similar trend. This notebook is clearly better-suited for casual gaming than the Acer TravelMate P255-M. When it comes to noise emissions, our review model's volume exceeds that of the structurally identical model without an independent graphics solution that we previously reviewed. At a maximum of 34 dB, our test device's noise level in idle mode significantly exceeds the TravelMate P255-M's sound pressure level (30.8 dB) -- even if it is not under load, the TravelMate P255-MG can be clearly audible. The two devices' noise levels during hard drive access are almost identical. The same goes for the DVD drive. The higher-performance graphics chip in the Acer TravelMate P255-MG-54204G50MNKK is also at fault for the notebook's maximum sound pressure level of 39.2 dB. At a maximum of 36.7 dB, the TravelMate P255-M is somewhat quieter. At a maximum of 30 °C (86 °F) on the top side in idle mode (maximum energy-saving options) and a maximum of 35 °C (95 °F) on the underside, our review device warms up a little more than the non-GPU version. The differences are even greater under full load (Furmark and Prime 95 running in parallel). While the TravelMate P255-M with the Intel HD Graphics 4400 graphics unit remained relatively cool (an average of 30.7 °C (87.26 °F) on the top side and 30 °C (86 °F) on the underside), the TravelMate P255-MG generates considerably more heat. The device's temperatures under full load measured an average of 36.7 °C (98.06 °F) on the top side and 34.3 °C (93.74 °F) on the underside of the notebook. In the stress test, we measured a maximum chip temperature of 75.0 °C (167 °F) on the Intel Core i5-4200U. The AMD Radeon R7 256M graphics card heated up to a maximum temperature of 81.0 °C (177.8 °F). During the test, the maximum clock rates remained at 2294 MHz (CPU), 1000 MHz (GPU clock rate) and 800-900 MHz (GPU-RAM). Here, too, the higher performance but also more power-hungry GPU reveals itself. 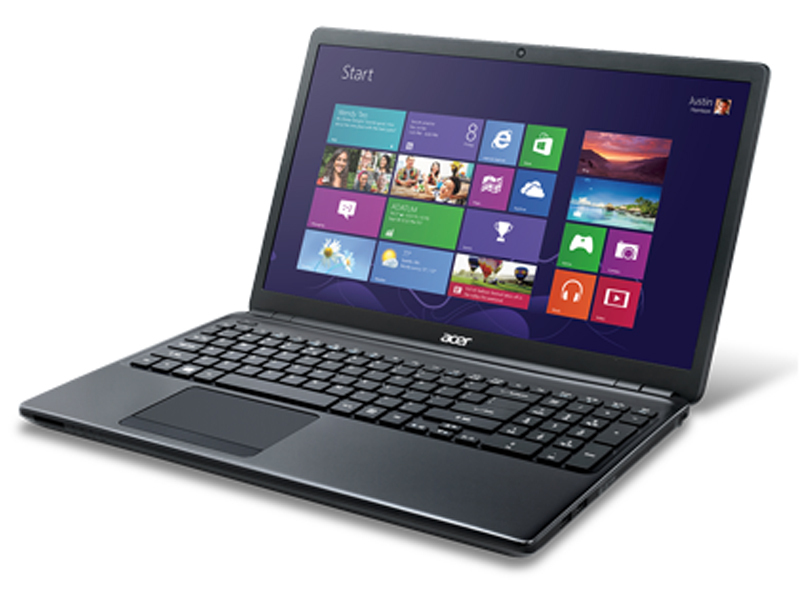 In idle mode, the Acer TravelMate P255-MG needs up to 16.3 Watts. That is almost double what the Acer TravelMate P255-M requires (8.4 Watts). The notebook's higher energy consumption is noticeable under load as well. Here the measurements come to 54.6 Watts (P255-MG) vs. 33.2 Watts (P255-M). The battery in the two TravelMate models is the same -- 37 Wh in the P255-MG as well. In idle mode, interestingly, the two devices' battery life is relatively similar. In this test, the energy-saving profile is activated, the wireless modules are deactivated, and the display brightness is set to minimum. The TravelMate P255-M ran for 6:29 h here, which is just a hair longer than the TravelMate P255-MG's 6:23 h.
In the WLAN test, we run a script that loads different websites at a 40-second interval. The energy-saving profile is active and the display is dimmed to about 150 cd/m². Here, you do have to deal with a significant loss of battery life. Instead of the TravelMate P255-M's 5:09 h, the P255-MG only has 3:30 h worth of steam. The Acer TravelMate P255-MG-54204G50Mnkk costs less than the TravelMate P255-M and offers a noticeably faster graphics solution to boot. The independent graphics card is an advantage for playing games but a disadvantage in the areas of battery life and emissions. Purely subjectively, the display is not exactly an improvement over the previous model. The increased brightness and contrast are not enough to outweigh the unstable viewing angles. The keyboard on the two devices is identical, so the TravelMate P255-MG also offers a comfortable typing experience. If you are looking to buy one of these two notebooks, it would be advantageous to consider whether you intend to use the computer solely for office tasks, or whether you would like to play the occasional game on it as well. For office use, the P255-M's performance is sufficient, but for gaming, the AMD Radeon R7 256M graphics solution is vastly superior to the Intel HD Graphics 4400. The rest of the notebook's equipment is precisely identical to that of its relative. In the end, the choice is either a better graphics solution or longer battery life. The greatly improved graphics performance provided by the AMD Radeon R7 256M is an added value for gamers, and with the comfortable keyboard, typing is fun too. Considering the new GPU, a bigger battery would have been a sensible investment, as it would provide the notebook with a longer battery life. 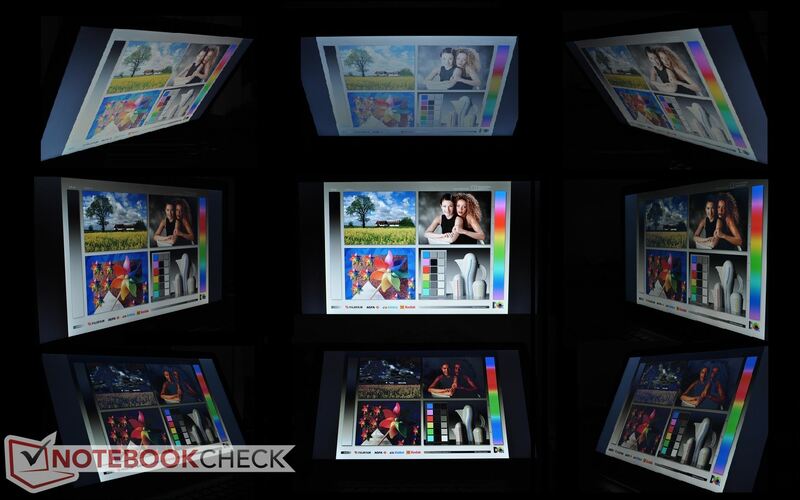 The display, manufactured by AU Optronics, offers higher brightness and a better contrast value. But because the viewing angle stability is so limited, the panel is hardly an advantage.